Minty Zaki, the queen of the ice cream set in jewel, always has an ace up her tasty sleeve, especially when it comes to racing. Refreshing and full of resources, Minty Zaki is a defender of good causes, but for the wrong reasons. If you look at Minty Zaki, here, you might notice that there's nothing particularly minty about her. 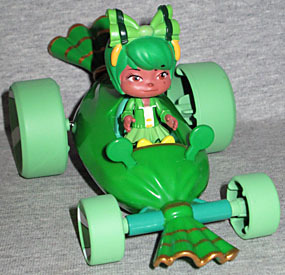 Sure, she's green, but that doesn't necessarily mean "mint" - the shape of her haircut suggests her theme is actually "sour apple," an idea that's borne out by the Disney Store's line of scented plushes: she smells like apples, not like mint. 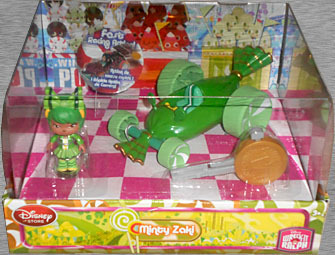 So apparently the name "Minty Zaki" was originally intended for a different character, but got applied to the sour apple girl when it came to merchandise. So what was her name supposed to be? We don't know. Make one up yourself. Puckerina Applebaum. Minty's kart is the adorably-named Veloci-Wrapper. Seriously, Wreck-It Ralph put more thought into things that you'll never hear on-screen than some movies put into their entire production. The kart looks perfectly like a wrapped piece of candy - so realistic, it looks like if you pulled on the ends, the whole thing would spin and unwrap. A lozenge might not seem as aerodynamic as some of the other cars are, but it's not bad - after all, raindrops are the shape they are because it offers the least air resistance. 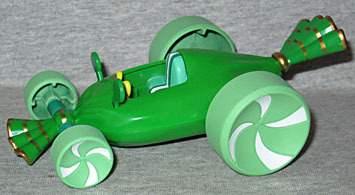 The body of the car is shiny green ABS plastic, while the tires are paler and matte. The white swirl patterns on the wheels are sculpted in, but to save money, each one is only molded once: so the swirls curve one direction on one side of the car, and face the other direction on the other side. Whoops! Don't worry, it's not distracting or anything. The racer sets are sold in nice boxes that display the toys well. The entire top is clear, allowing full views of the car and the figure (as well as the golden coin key). The bottom of the display is pink and white checkerboard, showing the start/finish line, while the back shows some of the grandstands - the peppermints that want Adorabeezle Winterpop to win, the candy corn that roots for Gloyd Orangeboar, and Minty's own gumdrops. This is a really lovely display, perfect for MOC collectors. 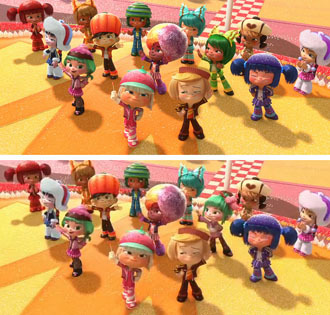 As mentioned previously, some of the Sugar Rush racers had palette swaps to create new characters. Minty Zaki is special, in that she got two recolors! The tan version is Torvald Batterbutter, while the blue one is Sticky Wipplesnit. Theoretically their cars are similarly hue-shifted, so buy three of this set and make your own customs! Whichever character it was originally meant to be applied to, the name "Minty Zaki" is actually a reference to famed Japanese animator Hayao Miyazaki - Miyazaki, Minty Zaki, get it? And yet, when the movie was taken to Japan, the character was removed and replaced by Minty Sakura, who wears a kimono, has her hair pulled into a bun on top of her head, and has raspberries and a stick of Pocky as accents. It's all very Japanese, but why the change? It's not like she's easily spotted in a lot of scenes - it's barely even an Easter egg. And Torvald and Sticky retain their original designs, so it's just Minty who got renamed and reskinned. How very odd.